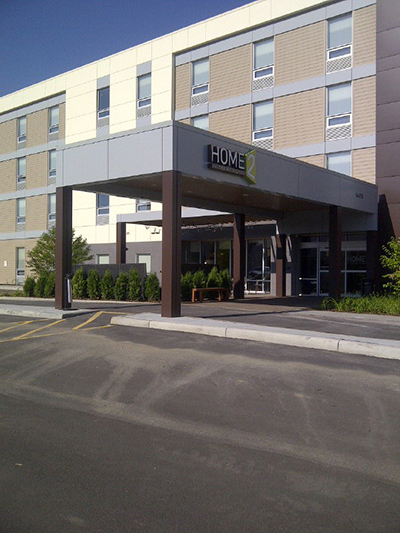 EDMONTON, Alberta, and MCLEAN, Va. – July 30, 2014 – Home2 Suites by Hilton, Hilton Worldwide’s award-winning mid-tier, all-suite hotel brand designed for modern business travelers and extended stay guests, today announced the opening of its 38th hotel, Home2 Suites by Hilton West Edmonton. This is the brand’s second international property and first in Canada. The hotel also showcases Hilton Worldwide’s continued commitment to expanding its footprint in the market with the company recently opening its 100th Canadian property. The property was constructed utilizing pre-fabricated structural steel studs for the building’s framework instead of the traditional wood frame structure, slimming the building timeline to less than 11 months. The innovative construction model also falls in line with Home2 Suites’ commitment to sustainability, as the steel pieces are 100 percent recyclable. The four-story, 127-suite hotel is centrally located with easy access to some of the city’s top attractions like West Edmonton Mall, Telus World of Science, Fort Edmonton Park and Edmonton River Valley. The hotel is owned and managed by SilverBirch Hotels & Resorts.